Did you know Zynga now generates more mobile game revenue than EA? Zynga’s narrative is heavily influenced by some historic facts. A disastrous IPO, bottom-dwelling stock price, high turnover of CEOs, Mark Pincus’ 66% control of voting shares, continuously loss-making. All true, but more recently new trends have developed. Perhaps the most significant is Zynga’s strongly growing mobile revenue. FY16 GAAP sales were $575 million, up 18% compared to FY15. 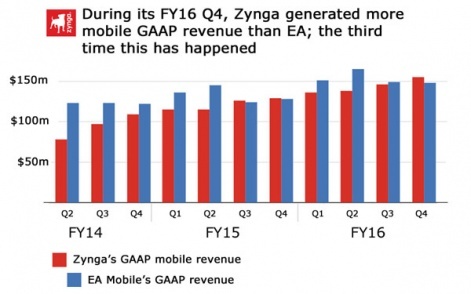 Indeed, one surprising outcome is that during its Q4 period, Zynga generated more mobile revenue than EA Mobile. Zynga posted revenues of $155 million while EA Mobile hit $148 million. The comparison is symbolic, of course. EA Mobile and Zynga aren’t direct competitors. But given EA Mobile’s strong growth over recent years, especially in 2016 - see The rise and rise of EA’s 'very profitable' $600 million mobile business - Zynga’s performance is all-the-more impressive. Looking at this graph, we can see it’s actually the third time Zynga’s quarterly revenues have been higher than EA Mobile’s. It also occurred during Zynga’s FY15 Q3 and Q4 (EA’s FY16 Q2 and Q3). This is interesting because it shows Zynga’s mobile growth has been strong for more than just 2016. As an aside, the reason EA Mobile strongly increased its sales in early 2016 was the success of Star Wars: Galaxy of Heroes. The top 10 grossing game was released in November 2015. As for the growth in Zynga’s mobile game revenue, it’s mainly due to the company’s continued strength in social casino games such as Zynga Poker and Wizard of Oz Slots. CSR Racing 2 launched solidly, generating $18m in six months. Also, strategy game Empires & Allies has performed well since its May 2015 release, while more recently CSR Racing 2 launched solidly, generating $18 million in the six months following its June 30th 2016 release. Despite this analysis, purists may argue bookings not GAAP revenue is a better comparison between the two companies. This is an accounting argument. GAAP revenue follows US regulations about how companies can account for sales that have been paid for but for which services haven’t been supplied - so-called deferred revenue. This is important for free-to-play games in which players can spend money on consumables and permanent items, which are accounted over different time periods. However, even considering non-GAAP revenues (or bookings), Zynga and EA Mobile run neck and neck. Zynga’s FY16 Q4 bookings were $167 million compared to EA Mobile’s $175 million, but in Q3 Zynga’s bookings were $162 million compared to EA Mobile’s $138 million. Another way of considering the two companies' mobile revenues is using Trailing 12 Months (TTM) figures. This simply combines the previous four quarters revenue to create a total for the past year and hence smoothing out any quarterly noise. 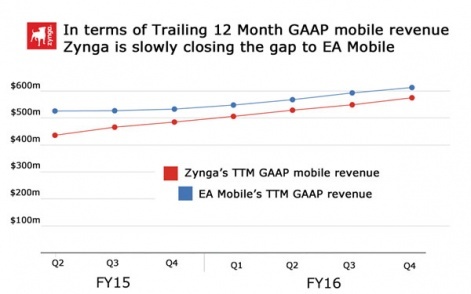 From the graph below of TTM GAAP revenue, we can see EA Mobile has always been ahead of Zynga, but that the gap is slowly closing. From the past quarter EA Mobile was $53 million ahead with TTM of $613 million, but in the quarter before the gap was $67 million. But to conclude, as previously stated, the comparison between the two companies is symbolic. Both are growing their mobile business at double digit annual rates. Only one has a strong narrative of growth, while the other’s relative success hasn’t been fully appreciated.